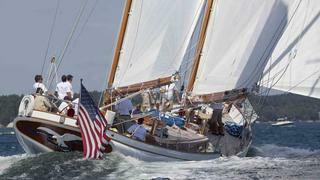 A fair number of fine sailing yachts are heading to Boothbay, Maine this Friday 12 August for the annual Shipyard Cup, hosted by founding sponsors Hodgdon Yachts, a fifth generation family-run yard with a 200-year-old boatbuilding tradition. The regatta is open to sailing vessels of 21 metres LOA and above, but typically entrants average over 30 metres in length. Among the several big dames participating is one of Hodgdon's own, the 47 metre Scheherazade, as well as the 41 metre Ron Holland-designed Pendennis Christopher, the 35 metre Holland Jachtbouw Whisper and the 35 metre Ted Hood-designed Tenacious. In its ninth year, the 'Corinthian Spirit' style competition of the Shipyard Cup is run under Bucket Protocol rating rules. The event kicks off at midday on Friday with registration, cocktails and in keeping with the Maine spirit a Lobster Bake at Hodgdon Yachts. Participating yachts will set off from Wotton's Wharf on Saturday for the first race at noon and again on Sunday for the second race, followed on both days by cocktails and parties amongst other festivities. Taking part alongside, or rather overhead, is a vintage airshow put on by the Texas Flying Legends Museum. After the racing on both Saturday and Sunday the skies will be a spectacle of rare World War II aircraft - including one of only two Japanese Zeros still flying (Last Samurai), a FG-1D Corsair (Whistling Death), a P-40K (Aleutian Tiger), a P-51D Mustang (Dakota Kid II) and a Mitchell B-25 Bomber (Betty’s Dream) – with the best views likely to be from boats off Boothbay Harbour. The event rounds off with the award ceremony on the afternoon of Sunday the 14th, when one of the yachts will take top honours and carry off the Shipyard Cup.